Former chief of engineering at Sikorsky Aircraft and long time associate of Igor I. Sikorsky, Ralph Lightfoot, passed away in January 2002. A graduate of University of Rhode Island, Lighfoot was hand-picked to join the Sikorsky Aircraft Division of United Technologies by company founder Igor Sikorsky. He went to work as a juion draftsman o June 13. 1935 and remained at Sikorsky for the next 42 years. He first worked on the streamlined, twin-engine S-43 flying boat. Then he was transferred to weight and eventually to the wind tunnels where he remained for the next 30 years. Within a few year the Chief Engineer Michael Gluhareff appointed Lightfoot Chief of flight testing. Mr. Lighfoot had the opportunity to work with many of the greats of aeronautical history, including Charles Lindberg, the brilliant Norweigian-American flier, Bernt Balchen (Balchen was the first man to pilot a plane over both the North and South poles, and Charles H. Zimmerman, who designed what became known as the "flying pancake," an almost circular airplane. When Sikorsky's interest shifted from fixed wings to helicopters, Lighfoot supervised the flight testing of the early model aircraft. In 1957 he became the Chief Engineer for Sikorsky Helicopters. He supervised development of the all-weather S-58 helicopter (more than 2,400 were built), the twin-turbine S-61 transport, the world's first flying crane - the S-60 and later the - S-64. Following retirement, Mr. Lightfoot continued to consult with the industry, taught classes at his alma mater while dividing his time between homes Cape Cod and Dytona Beach. He was active in AHS affairs and served on the Executive Committee of the Society during the years immediately following World War II. 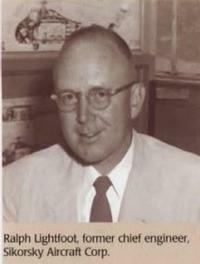 In 1948-49, he was AHS President in in 1967 he was elected an AHS Honorary Fellow.